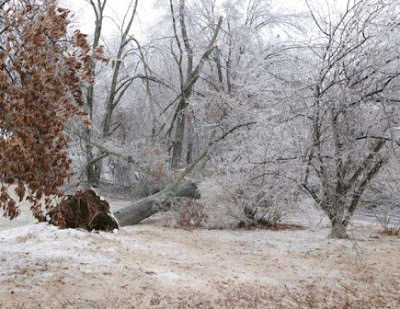 400K still without power after deadly ice storm. At its peak, more than 700,000 without power. 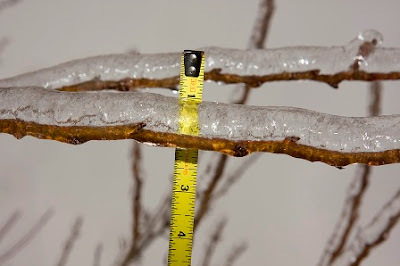 LEITCHFIELD, Ky. (AP) — National Guard troops swinging chain saws made their way into isolated Kentucky communities Sunday to check on residents walloped by a winter storm that Gov. Steve Beshear called the biggest natural disaster ever to hit the state. Some 4,600 guardsmen fanned out across Kentucky to distribute food and water, remove fallen trees, go door-to-door in hard-hit areas and provide security in communities that have been evacuated. With high temperatures well into the 40s through the weekend, much of the ice that had clung to buildings, power lines, trees and roads has disappeared. 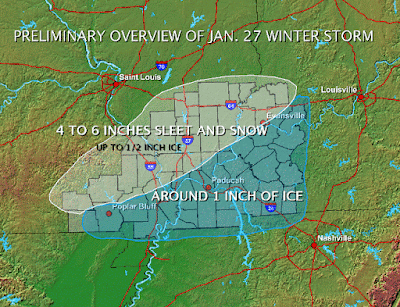 And another winter storm that had been forecast to hit Monday apparently will bypass the state. "Hopefully we will dodge the bullet," Beshear said. "We're keeping a watchful eye on that." Power outages and tree damage were widespread. As of late Tuesday evening, Paducah Power System reported 19,000 of their 22,000 customers were without power. A preliminary estimate from Paducah Power was that 3 to 5 days would be needed for restoration of power. Trees fell on many homes and cars. Warming shelters were opened for those without power. Check with local broadcast media for more information. 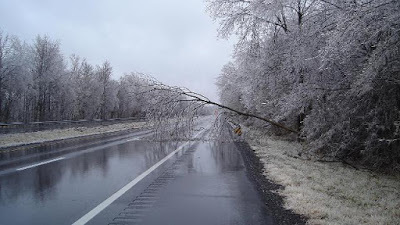 Numerous trees and power lines were blocking roads and causing a major travel hazard. Communications outages were impacting many homes and businesses, as well as the National Weather Service in Paducah. Service backup was being provided by neighboring NWS offices. Most NOAA Weather Radio stations operated by the Paducah office were off the air early Wednesday morning. The ice storm impacts seemed most severe south and east of a line from Evansville, IN to Carbondale, IL to Bollinger County, MO.